Encounter the revitalizing taste of orange coupled with chunks of the dark chocolate in this easy to make bundt cake. This stunner is topped with sheen of orange syrup and then made even better with an audacious layer of a chocolate satin glaze. Orange flavor is always intensified by chocolate and the two flavors together offer a taste of the divine. This cake was inspired by Ina Garten, who originally made a version of this cake years ago, as well as, David Leite’s version. David Leite is a cookbook author and the publisher of Leite’s Culinaria website - a new and amusing discovery for the goddess! The Chocolate Goddess is always petitioned by friends and neighbors who seem to want to find a way to make good recipes quicker and easier. While some recipes do not lend themselves to alteration for abridged version this one did and it is delicious. Thanksgiving is early this year so it’s time to think about your menu. With so much to cook and prepare, this cake is a wonderful and easy addition to your dessert table. Those of you who can boast of being a guest and not have to bear the brunt of cooking an entire Thanksgiving dinner, should volunteer to lend a hand and make this delectable dessert. Everyone will be thankful! Butter and pan and dust with flour. Chop semisweet chocolate in ¼ inch pieces. Dust with 1 tablespoon of flour and set aside. Combine cake mix, pudding, orange juice, sour cream, vegetable oil, extract, whisked eggs, on low speed until blended. Beat on medium speed for about 2 minutes. Bake approximately 40 minutes or until toothpick comes out clean. Let stand for 25 minutes and make glaze. Invert cake onto platter and put waxed paper around edges to catch syrup drippings. Combine orange juice and sugar on low in a small saucepan. 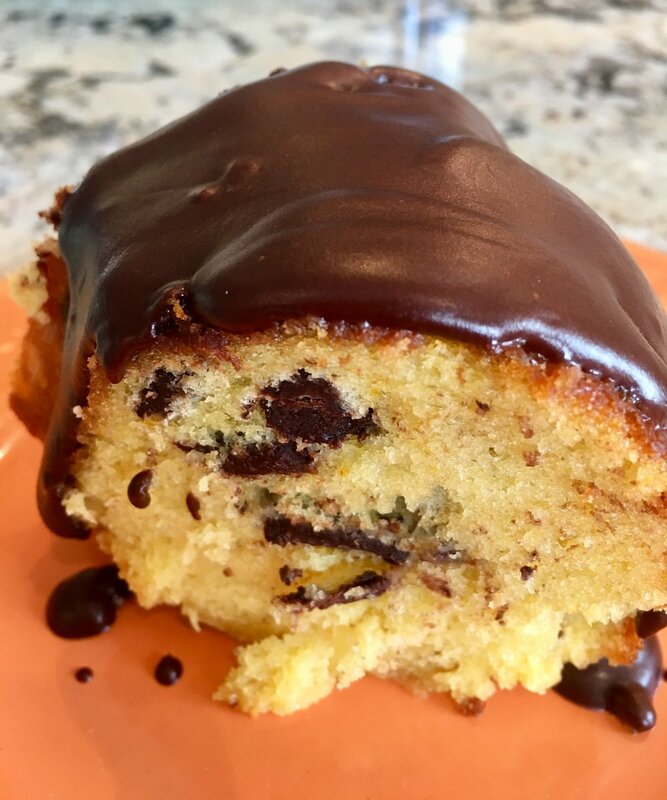 Melt chocolate chips, butter and light corn syrup in a double boiler Do not dissolve chocolate chips completely in order that chocolate doesn’t burn and in order that it may retain its shiny appearance. Alternately, you can use a double boiler. Stir until chocolate is completely dissolved. Cool for 10 minutes and drizzle over cake.